Yes yes, I know I'm a sucker for cheesy titles, but with a name like Gaya, it seems hard to resist! My love for Gaya handbags though, is all serious. I'm really feeling some local pride for Vancouver's Wei Wei Chang, the designer behind Gaya. Every season, Gaya's collections stand-out among the myriad of copycat handbag lines out there. This season is no exception as Gaya puts out another stellar line of fun, modern totes and shoulder bags. Current "it" shapes like hexagons and lady satchels make their appearances in Gaya's spring options, but are revamped with bright teals, pinks and purples mixed and matched with carefree abandon. 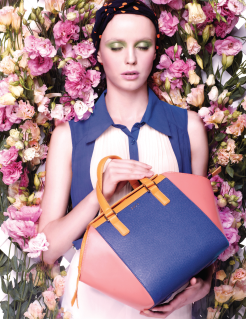 Inspired by colour-blocking and Asian foliage, Gaya's Spring 2013 bags are a perfect way to add a feminine touch to the season's minimalist, mens-wear inspired pairings. 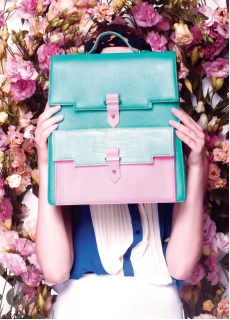 Check out the Gaya spring lookbook below and go to their website to find the nearest seller to you! *gasp* i Loooooove that first one!